News :: The Union exists to promote golf in the County and to provide competition for the top county players as a route to Midland and International golf. We are always on the look-out for additional Category 1 golfers and are pleased to have welcomed Rob Parkes (Trentham GC), Andy Martin (Leek GC), Ian Skidmore (Enville GC), Jim Chambers (Beau Desert GC) and Terry Bray (Sandwell Park GC) as new players in 2018. Our inter-County matches comprise teams of 12, playing 9 holes of Greensome or Foursome (League matches) in the morning, followed by 18 holes of Better Ball. If you're aged 55 or over and are interested in knowing more about playing for our County Seniors please contact Seniors Secretary Mark Ashton (Ingestre Park GC) via email to staffsseniors@hotmail.co.uk or calling 07889 580000. We look forward to hearing from you. Congratulations to Kelvin Edwards (Whittington Heath GC), who received his 50 Appearance Points trophy following our match v Northamptonshire Seniors at Great Barr GC on Tuesday 11th September 2018. Pictured above are Kelvin with his trophy and Captain Mark Ashton. Following our match at Notts (Hollinwell) GC v Nottinghamshire on Monday 13th August Bob Aston (Trentham Park GC) and Duncan Stott (Trentham GC) were presented with their 50 Appearance points trophies, and at the same time Colin Heard (Stone GC) received his County Blazer badge for eight matches played. Our team of Bob Aston (Trentham Park GC), Terry Bray (Sandwell Park GC), Andy Guy (Leek Westwood GC), Derek Verey (Beau Desert GC), Steve Wild (Trentham GC) and Colin Woolley (South Staffs GC) performed well at Kedleston Park GC on Thursday 9th August, finishing third of the ten Midland Counties. In the morning round Bob Aston shot our lowest score with a three under 69, in the afternoon that accolaid goes to Terry Bray with a 74. Next year this annual event will be played at Coxmoor GC, again in the second week of August. Two members of the Staffs Seniors squad (Bob Aston - Trentham Park GC & Warwick Holland - Sandwell Park GC) played in this prestigious event at Royal Pawthcawl GC in the first week of August. Unfortunately when the field was whittled down to the top 60 and ties, after the first two rounds, neither player progressed. Congratulations go to Ian Wilson (Beau Desert GC), who received his 50 Appearance Points trophy following our match v Cambridgeshire Seniors at Bloxwich GC on Monday 30th July 2018. Pictured above are Ian with his trophy and Captain Mark Ashton. The new format for this annual competition (36 holes over two consecutive days) was used for the first time at Henlle GC, near Oswestry on 18th & 19th July. 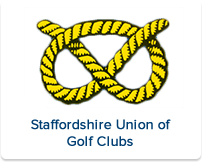 Five Staffs Seniors entered, with particularly noteworthy performances from Bob Aston (Trentham Park GC) who finished in 2nd place and in the Team event Beau Desert GC members Ian Wilson & Jim Chambers finished in 3rd place. Congratulations to Ben Rhodes (Beau Desert GC) who won this year's Seniors Championship on 9th July at his home course with an impressive Gross 70. Ben's third win in the competition sees him go forward and represent the County in the England Golf Champion of Champions tournament at Woodhall Spa in September. Warwick Holland (Sandwell Park GC) played in his eighth match for the County Seniors on Thursday 5th July and thereby earned the recognition of being awarded his County badge. Congratulations to Staffordshire Seniors player Bob Aston (Trentham Park GC) for his outstanding performances in this year's National Championships. He again made the cut in all three events that he entered, in what is always the busy month of June. He finishing tied 43rd in The English at Sherwood Forest and Coxmoor GCs, tied 28th in The Scottish at Irvine GC and most recently tied 18th in The Welsh at Pennard GC. Congratulations to Staffordshire Seniors player Derek Verey (Beau Desert GC), who along with Leicestershire & Rutland Senior Gilbert Scouler, won this year's Gross event at Fulford Heath GC on 23rd May. In a Staffordshire double, the winners of the Nett event were Roger Tuohy and Nigel Shaw (Ingestre Park GC). Our immediate past County President Martin Payne also competed, at the club that he's a member of. Congratulations to our Vice Captain, Colin Woolley (South Staffs GC), who was presented with his 50 Appearance Points trophy following our season opening match v Cheshire Seniors at Astbury GC on Tuesday 1st May 2018.